For anybody who predicted a Charlotte beer slowdown in 2015, you know by now how wrong you were. New outfits opened, existing ones grew out or over, national and international recognition was earned, and some damn good local beer was to be had. The Queen City's beer scene is not a game, and I foresee loads more growth in the coming year. But, I'm getting ahead of myself. Time to don my best pair of 20-20 Hindsight glasses and attempt to put some perspective on, or simply remember, everything that's happened in Charlotte's burgeoning beer scene. First off, let's say hello to the new blood, with July alone seeing three introductions. Free Range Brewing masterfully weaves seasonally-available ingredients into its beers. Wooden Robot Brewery has success with its rotating IPA recipes and inventive sours. Red Clay Ciderworks has impressed, especially with its recently-released bourbon-barrelled version. Nearby, Three Spirits entered the scene on solid ground with its "comfort beers." Plaza Midwood also eagerly welcomed Legion Brewing to its neighborhood. New outfits aren't the only ones that get to enjoy that "new brewery smell." Birdsong Brewing moved into swankier new digs in April, just a mile south of their first home, replete with a system that triples its original brewing capacity. Birdsong's former neighbors, NoDa Brewing Company, also christened a new facility a mile north, opting to keep its original home focused on brewing specialty releases while the new spot allows for quadruple its initial brewing capacity. In simple equipment expansion news, it'd probably be easier to name breweries that didn't expand fermentation capacity versus all those that did. Nothing looks better than a nice shiny medal, as three of our breweries can attest. September's Great American Beer Festival saw Sycamore Brewing scoring Bronze with its Southern Girl Lager, with nearby Triple C Brewing similarly taking home Bronze for 3C IPA. In a stunning upset across the pond, our own Olde Mecklenburg Brewery waltzed out of the European Beer Star competition with a Gold for Mecktoberfest in the German-style Märzen category. Now, for some bad news: local favorites are about to get squeezed, courtesy of gross inaction by a subcommittee in the North Carolina legislature. After years of growth, locals NoDa and Olde Mecklenburg will be forced to throttle production in the coming year. It's either that, or be forced to transfer rights to a third party distributor, a move that would cost dozens of local jobs. I hate that their beer will be harder to find, but love how they're siding with their employees. The legislature didn't get it all wrong this year, however, making it just barely easier on local distilleries. As a result, two new options opened in Southend, Doc Porter's and Great Wagon Road. #CLTBeer, meet #CLTHooch. I'll be interested to see what partnerships can be forged between these two camps. The idea of local beer aging in local barrels interests me. Miscellaneous goings-on worth a special mention? The Cellar at Duckworth's brings a unique and interesting speakeasy vibe to Uptown. Five Charlotte breweries teamed up with Colorado's New Belgium for a pair of collaborative brews. Special recognition to Heist on their recently-released barrel-aged Cataclysm 2 imperial stout; that's one of my overall favorite beers this year, well done. So, with all that's happened this year, what concrete things do we have to look forward to? Lenny Boy Brewing is opening a massive new facility for their beer/kombucha production, for starters. Salud Beer Shop, Charlotte's smallest nanobrewery, will release its ambitious in-house beers. GoodRoad CiderWorks should debut its ciders and meads. Blue Blaze opens in FreeMoreWest, the area's first brewery. Sycamore Brewing is also poised for some big expansions. 2015 will go down in my mind as the year I miserably failed at my one resolution: taking notes for this column as I go along, instead of playing December catch-up. Why lie, I fearlessly predict the same for next year. Other fearless predictions for 2016? 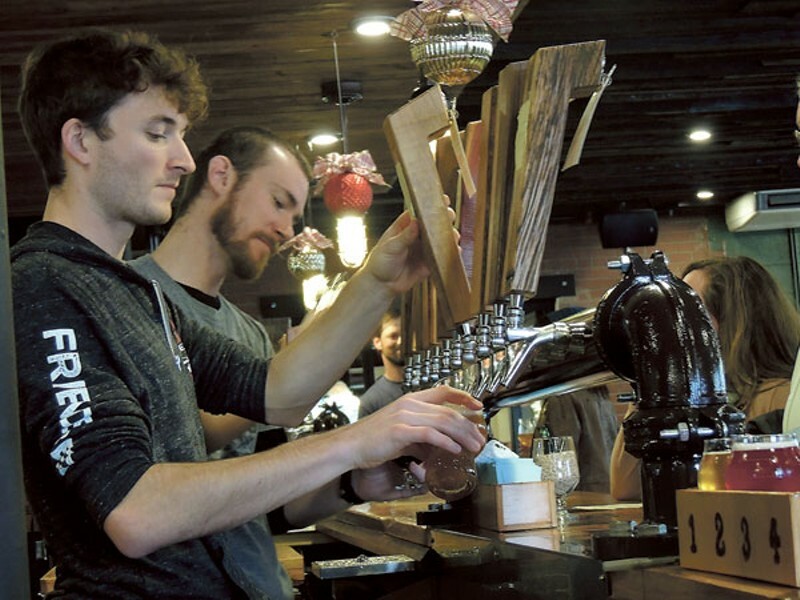 More breakneck growth for local breweries, and more entrants into the market. An unprecedented fight for tap space as these newer folks stretch out from their taproom into the wider world. We got lucky in 2015, with the new crop of brewers failing to stumble out the gate as they learned their new systems, but call it a hunch: we won't be as lucky in the coming year. Less likely, but it wouldn't surprise me: a local brewery either shuttering completely or getting bought outright. Just reading the tea leaves here, friends. See y'all here next year, when we'll discuss how right/wrong I was.